Customer expectations are changing rapidly. The days of mass customisation are now moving more towards a mass personalisation mind-set, and, as a result, manufacturers are increasingly faced with a need to focus greater efficiencies and reduced lead times, whilst maintaining standards of high quality, consistency and reliability. The issue of quality control has been the subject of a number of headlines over recent months, as the pressure of getting products to market has led to a fall in the quality that consumers quite rightly expect. In order to navigate the challenges of quality control within the manufacturing sector, technology is becoming a vital tool. And those companies, with a SYSPRO ERP solution at their disposal are provided with the insights that will help them ensure their products are manufactured consistently, on time, and to the correct specifications, meaning rather than them being reactive to situations manufacturers can remain one step ahead. While every sector faces challenges with regard to quality control, the food industry has in particular gone through significant changes and developments in recent years, from a number of high profile product recalls to increased legislation and an increased focus on consumer labelling. In a sector where traceability is a key component, ERP is becoming an indispensable tool, from managing processes, collating inventory information in addition to vital quality control and safety checks. This means that products are not only manufactured and delivered on time, but products are safe and meet with compliance. The prospect of a recall within the food sector has the potential to be extremely detrimental to a business, but by utilising an ERP solution, manufacturers are provided with complete visibility. Processes that have previously been tracked and handled manually can now be done automatically, improving efficiencies across warehouse operations and the entire supply chain. Highly complex operations have also now become much easier to understand with a comprehensive ERP solution, which provides enhanced real-time information across entire operations providing, businesses with complete visibility. The complete traceability and recall functionality that SYSPRO ERP provides allows businesses to implement the procedures for a recall, quickly and efficiently and ensuring customers and suppliers are notified immediately. In the race to get products to market, the technology sector, and more specifically the telephone market, is the latest sector to face the challenges of quality control. According to Hector Abruña, the director of the Energy Materials Center at Cornell University, the issues faced by Samsung in relation to its latest battery design have been caused by failing to identify critical design issues at the manufacturing stage. As the company focused on designing and producing batteries that are slimmer and more lightweight, Samsung used separators which were too thin, causing batteries to short circuit. Hector Abruña reiterates that, “the issues are a direct result of quality control issues”, arguing that, “There was also an issue with quality control in which the layers were not properly aligned, giving rise to shorts.” Quality control issues at Samsung have resulted in the company having to recall an estimated 2.5 million devices in total so far, incurring significant financial costs and reputational damage. 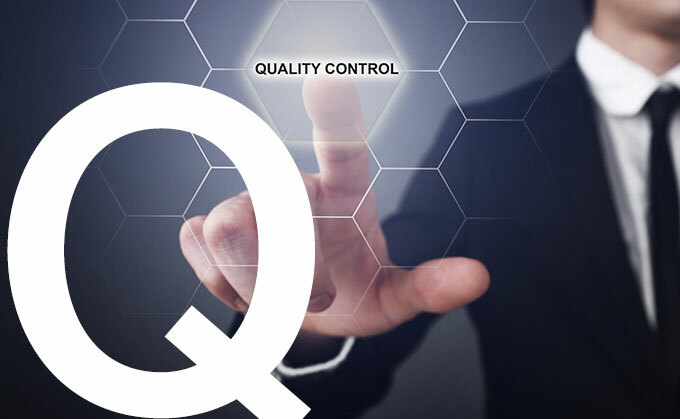 Quality control across the manufacturing sector as a whole is an essential part of the production process. However, across the pharmaceutical sector the importance of quality control procedures mean far more than ensuring products are delivered on time and adhering to compliance. A lack of stringent controls could be the difference between life and death. Quality control within the pharmaceutical industry is essential, as businesses face strict compliance criteria set by a number of authorities, including the Medicines and Healthcare Products Regulatory Authority and the Good Laboratory Practice Monitoring Authority. SYSPRO ERP provides a platform for pharmaceutical manufacturers with complete transparency across the entire supply chain providing tools including inventory management, allowing manufacturers the ability to have full access to information including full details of ingredients, as well as batch numbers and expiry dates. The reporting and inventory functionality of SYSPRO ERP ensures there is no room for error and manufacturers can remain proactive and responsive to the changing regulatory landscape. It is clear that the manufacturing sector is becoming increasingly competitive, as consumer demands means businesses are having to work smarter, more efficiently, whilst remaining innovative. These considerations are, of course crucial. However, businesses must not lose sight of maintaining the highest standards, adhering to compliance and providing customers with the assurance of quality.